Historians argue as to whether St Patrick ever founded a monastery. In his own words, ‘The sons of the Irish and the daughters of their kings are monks and brides of Christ’. This may apply to individuals, not monasteries. But without question monasteries sprang up in abundance in a very short time -the 6C was the apogee of monastic growth. Every local tribe gave land for them to enclose and build a church. 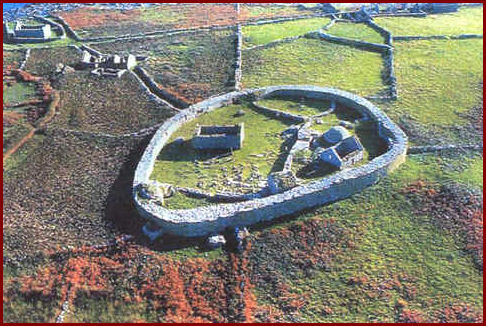 St Enda may have built a monastery on Inishmore in the Aran islands in Co Galway in 480. He lived there for 50 years. 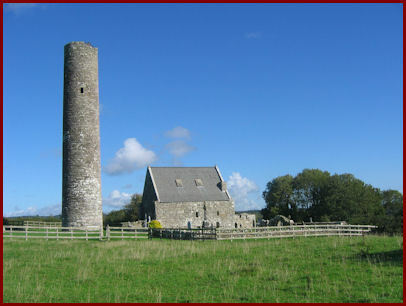 Killeany (‘church of Enda’) is the site of St Enda’s monastery. Another more beautiful spot can scarcely be found. It looks across the sea to Connemara with its 12 ‘bens’, or mountains. The place made a huge impression on me, so much so that I once had a vivid dream that the Last Day began here and all the dead were being raised from their graves. As I watched the dead come forth with nanosecond speed; all I could hear was a heavenly choir singing ‘And the dead shall be raised…’ repeated over and over again. It was frighteningly real, and utterly scary. Since then I have revered this mound of sand as truly sacred ground. It is not surprising: St Enda and 120 of his brethren are said to lie under it. A perfect site for a hermitage. The monks sought solitude for the sake of prayer. They prayed because they believed Christ would come and they wanted to be ready when he came. They knew they were granted but a time in which to repent and save their souls. They believed that because the Risen Christ had overcome the forces of darkness, death and sin, that there was a victory in the spiritual conflict which Christ would make manifest in the human heart. They believed that intercession was effective and that all people must be prayed for. They often sought out pagan graveyards, the old spiritual sites, the ancient trees and holy wells, so that Christ would reclaim these too by their prayers. That is why they sought Islands both inland and on sea. The Desert Fathers of Egypt built ‘cells’ for themselves in the desert. 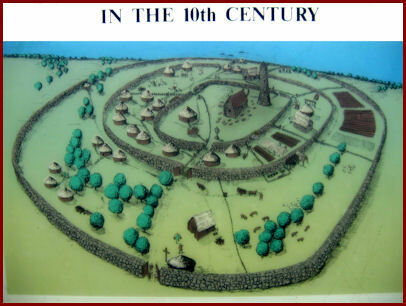 In Ireland they built them on islands as well as in out of the way places on land. Originally the cell and church would have been of wattle and daub, or wood. Later they were built out of stone. 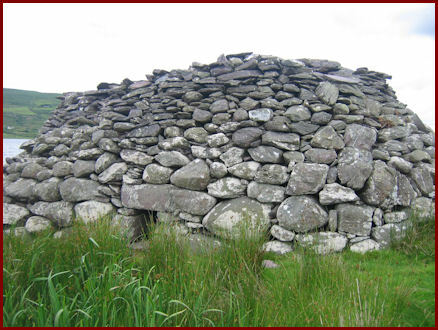 In this picture of Mahee Island in Stragford Lough Co Down the walls are stone, the roof made of wood tiles, and the distinctive beam ends are called finials. 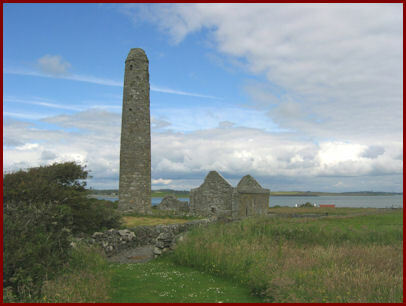 Mahee Island on Strangford Lough, Co Down, is the perfect example of a monastery shaped by 3 cashels around it. The inner one has with in it the church, abbot’s house, round tower and graveyard. 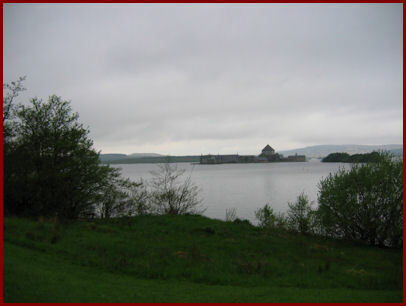 The site is also surrounded by the Lough underlining the importance of the sea for travel. St Machaioi is said to have been a convert of St Patrick. This may be so but excavations have not found anything on site before 7C. It may also be that St Machaioi was an itinerant bishop, evangelising in the ‘basin’ formed by Kintyre, Galloway, Dumfries, and the Isle of Man. The big waterway that goes through the Upper and Lower Lough Erne has scores of islands. Its location was also exceptionally useful for travel up and down the country. 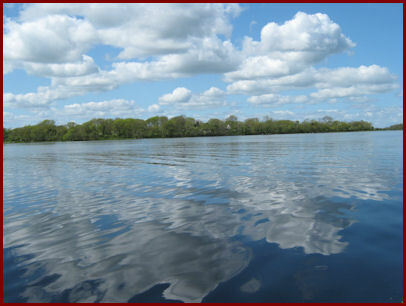 St Dermot (6C) chose Lough Ree in Co Longford and the island of Inchcleraun for his monastery. Like Holy Island in Lough Derg it too became a monastic city with many churches. One of the churches can just be seen amid the trees right of centre. St Senan (6C) and his disciples evangelised all round Clare. He put his monastery on Scattery island in the mouth of the Shannon where all could see as they travelled by. It too became another monastic city. There is a Lough Derg in the Shannon in Co Clare, and in it is Holy Island, founded (perhaps afresh) by St Caimin (7C). 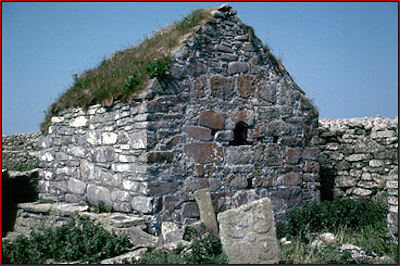 Buildings on the island have been preserved well, with several churches including the ‘house’ of St Caimin. 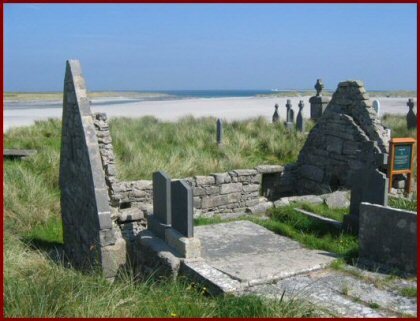 There is also a sizeable ‘Graveyard of the Saints’ where many graves lie untouched in situ. There is an exceptionally good feel to the whole island. St Ciaran (524) was a pupil of St Dermot. He founded his monastery on the banks of the Shannon in Co Offaly at almost the middle point of Ireland. The Shannon provided travel north and south and along a ridge travelling east and west. It too became a monastic city and the burial place of kings. St Ciaran’s 8C ‘house’ for his relics looks all askew because pilgrim’s have taken soil from under the foundations to take back home with them. Some Islands are almost islands. 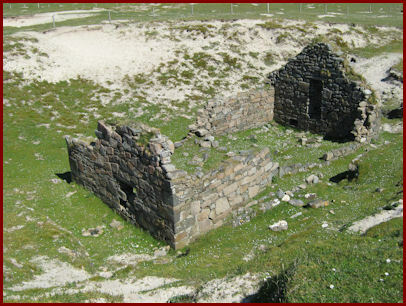 St Conal (6C) founded his monastery on Iniskeel, Co Donegal. It probably was an island in 6C, but now the tide recedes for a short time each day thus allowing access by foot. The tide comes in and out on both sides of a sandy strand allowing one to walk across (like Moses) with water receding on both sides. On the other hand Tory island off the top of Co Donegal is a real island requiring a day’s boat trip. 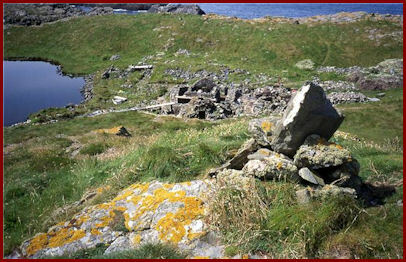 St Columba and his disciples founded the monastery here. 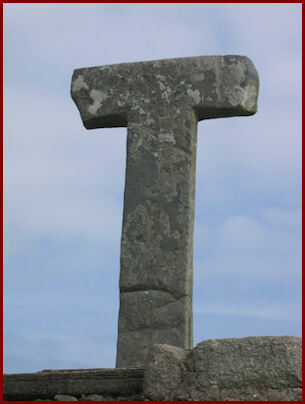 One is rewarded by one of the very rare Tau crosses still left in existence, the sign of the authority of an abbot. 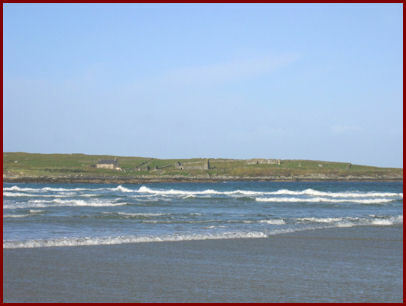 Another real island trip is afforded by Inishmurray in Sligo Bay. This is one of the most outstanding sites of Ireland though difficult to land on except in the calmest of weather. It was inhabited till 1948 when the severe conditions of living on the island became too much. Not only does the great (rebuilt) cashel protect St Molaise’s house’ which still has its roof on but there are outdoor altars with cross slabs on around the island where pilgrims did the ‘rounds’ of prayer. 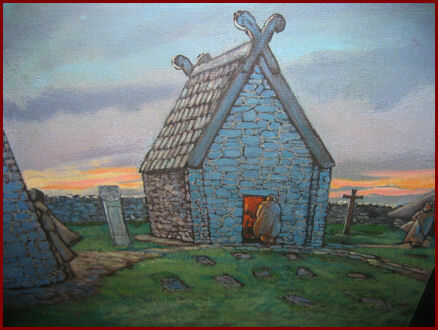 Very many of the islands off the west coast of Ireland had monks on them. 11 of them are off the coast of Connemara. St Fechin founded monasteries on High Island and Omey island. High Island is very difficult to land on. In the very centre of the picture is a Bee-hive hut with Church and Enclosure behind. Omey on the other hand is another ‘almost’ island. At low tide one can drive across the sand. 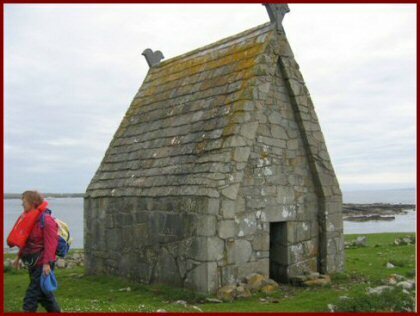 The church was discovered only in 1981 when someone saw the top of a gable protruding from the sand. There is also a holy well overlooking the shore. 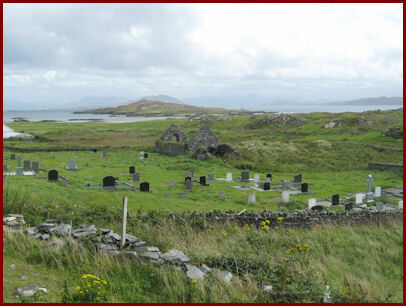 St Colman’s Church on Inishbofin. St Colman (675) was Bishop of Lindisfarne in Northumbria. 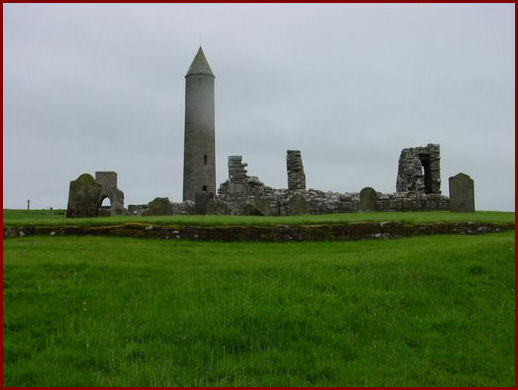 After the Synod of Whitby he returned with some of his brethren, both Irish and Saxon, to Co Mayo. He eventually settled in this little valley on the east side of the island. 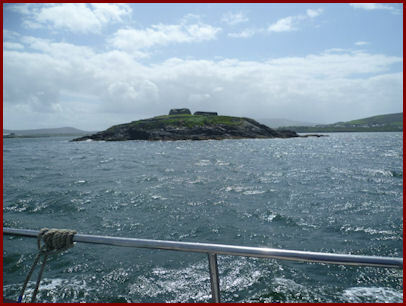 St Macdara (6C) had a monastery on the small island named after him, off the coast of Connemara. The existing all stone structure preserves the architecture of its wooden predecessor, included the pattern of the tiles and finials. Now restored, it presents itself as a another very tiny complete church on a small island with little else but many sheep. Quite amazing and utterly astonishing. The small size suggest it was a shrine church. St Senan built a monastery on Illauntannig, one of the Maharee islands just off the north side of the Dingle Peninsula in Co Kerry: it is astonishingly complete even today. The island has its own microclimate. Everything is there; cashel, beehive churches, beehive hut dwellings, graveyard cross and souterrains. It is hard to take it all in. Words just fail. Not far from Lough Erne is Lough Derg in Co Donegal. St Daveoc (5/6C) lived there long before it became a hugely popular destination of pilgrims in mediaeval times. The monks prayed to Christ to cleanse them of their sins; likewise the pilgrims. 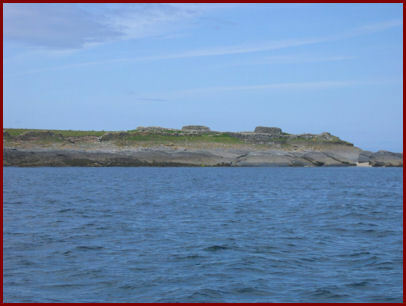 On Station Island there was a cave called ‘St Patrick’s Purgatory’. Whether St Patrick came here no one knows, but it is possible. The cave may in origin have been simply a heated ‘sweat house’ for straightforward bodily cleansing. But later, what with the tiny space and the rising vapour, perhaps it became a symbol of the entrance to hell. The cave was closed in the 17C. Regular three-day pilgrimages still continue to the ancient penitential stations situated outside the cave. No one is allowed to go to the island for any other purpose. In the old days pilgrims spent 15 days of fasting, going about barefoot and prayer; today it is only three days. 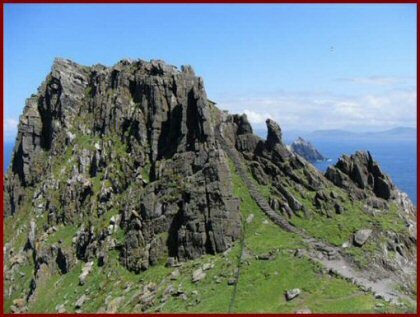 There is yet one more: Skellig Michael, a 700’ high rock, twelve miles out in the Atlantic. The monastery, near the northwestern peak, sits on a terrace above a long flight of steps. 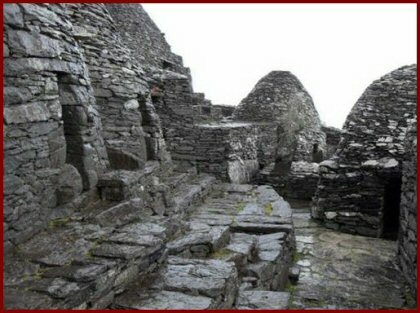 In the terrace are six bee-hive dwellings (clochans), two oratories and 31 grave slabs. The wall of the huts are 2 metres thick. Near the top, on the higher southwestern peak is a hermitage. Such is the remoteness of the terraces on which the hermitage sits, access is very difficult and requires rock-climbing skills. The first terrace is a small garden, the second has a small oratory, tomb shrine (leacht) and cross-slab. 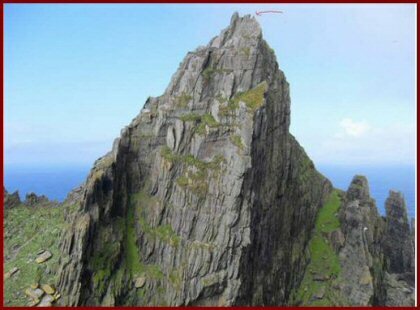 On the very top pf the pinnacle is the spit where until recent times a stone slab existed which required fortitude of the most extreme type to access and kiss. The monastery was founded St Finan in 7C. 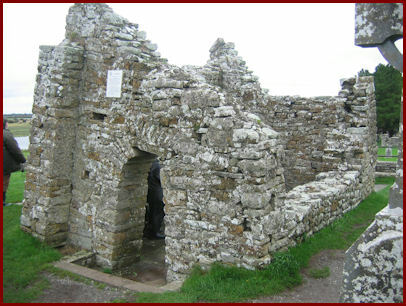 It survived Viking attacks, including the death of the abbot, and lasted till the 12C when the remaining monks continued their life at Ballinskelligs Co Kerry. The hermitage is on the terrace on the left near the top. The spit on the top is marked with an arrow.